Rina Lazo was born in Guatemala City. While attending the Academy of Fine Arts in Guatemala, she won a scholarship to study painting in Mexico. Rina attended La Esmerelda School of Painting and Sculpture, where faculty members included Diego Rivera and Frida Kahlo. 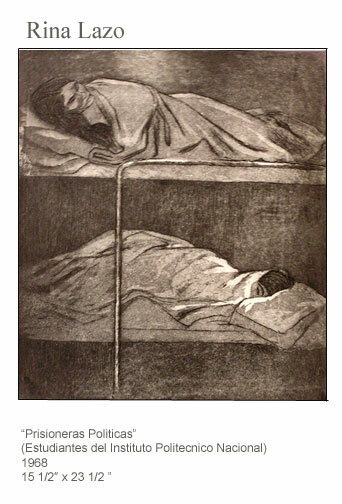 She mastered engraving techniques under Leopoldo Mendez, Pablo O’Higgins and her future husband, Arturo García Bustos, while assisting at the Taller de Grafica Popular. In 1947, Rina began work with Rivera on the fresco Paseo Dominical en la Alameda, in the Hotel del Prado. She assisted on numerous projects including the mural in the Lerma Water Intake Station, in Chapultepec, and the mosaic of natural rock at the Olympic Stadium at the University of Mexico. Their association lasted 10 years, until his death in 1957. Murals by Rina are on public display throughout Mexico and Guatemala. In 1948, she painted the mural, Zapata, at the Primary School in Morelos. The following year, she completed The Four Elements in Mexico City. In 1953, Rina painted the fresco Tierra Fertil at the Museum of the University of San Carlos of Guatemala. In 1966, she reproduced paintings from the ruins of the temple at Bonampak. At the ruins, she made drawings of the Mayan images, then faithfully reproduced them as frescos, in a replica of the temple constructed in the garden outside of the Maya Salon, at the National Museum of Anthropology in Mexico City. Her mural, Venerable Abuelo Maiz, prominently displayed in the Maya Salon, was inaugurated in 1994. Her work is part of permanent collections in Mexico, including the University of Contemporary Art and the Museum of the State of Mexico; and in Guatemala, at the University Museum of San Carlos and the Museum of Modern Art.